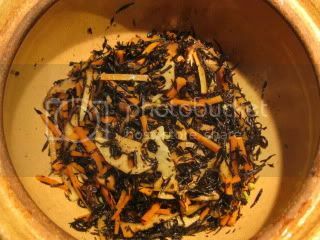 At our home, our consumption of hijiki seaweed is so high that I keep stock of many packages of dry hijiki in pantry all the time. 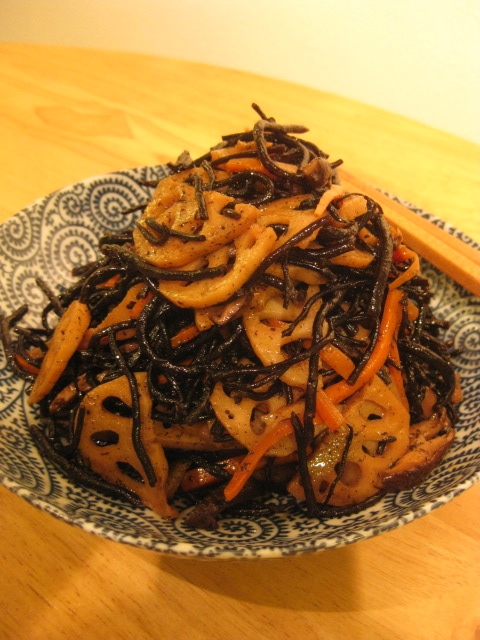 Hijiki tastes especially wonderful, when it's cooked in donabe. Our soup & stew donabe, "Miso-shiru Nabe", is always my choice of donabe for hijiki. It makes effective quick braise/ simmer and hijiki tastes really deep-flavored as a result. This hijiki dish is very easy and also you can enjoy it as a salad at cold or room temperature. 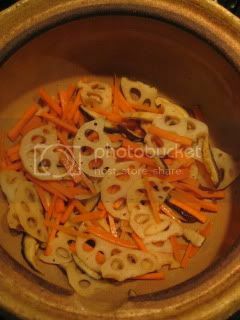 Lotus root gives a nice crunchy texture. 1. 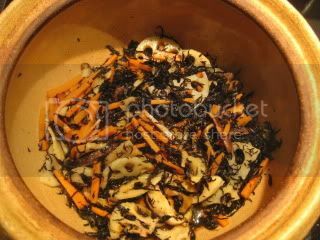 In the donabe, sauté the hijiki, lotus root, carrot, and shiitake in olive oil over medium-heat. 2. Add the sake, dashi stock, sugar, and soy sauce. 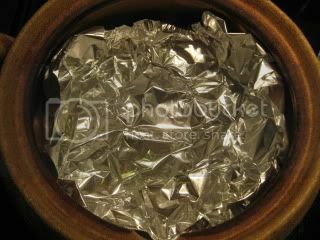 Line the surface with a piece of foil or parchment paper and cover with lid. Bring to simmer. Cook for 10 minutes over medium-low heat. 3. Uncover and continue to simmer until the liquid is reduced to very low. Turn off the heat and add the dry red chili. You can serve immediately, but it would taste better after letting it rest for 2-3 hours. 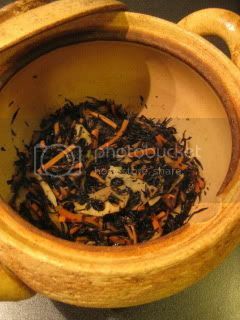 The dish can be refrigerated and kept for 2-3 days. You can use either long or short hijiki (in the top photo, the dish was made with long hijiki, and the procedure photos shows short hijiki).